New College is committed to providing an open and safe environment which both values and promotes diversity and equality of opportunity, encouraging all our staff and students to fulfil their potential. The Tutor for Equality and Diversity is Grant Churchill, and the Warden chairs the Equality and Diversity Committee, composed of senior and junior members. If you would like to find out more, please read the College's Equality Policy. There are many groups which historically have been under-represented at Oxford, and New College is no exception. We are committed to do our very best in changing this. We work with schools and students of all social, ethnic, religious and educational backgrounds, seeking to ensure that everyone of outstanding academic potential feels able to apply to Oxford. There are many groups that are currently under-represented at the University and New College is committed to changing this. To that end, we work with students from state schools from across the country, encouraging them to apply to the University and supporting them to build a competitive application if they do choose to do so - both visiting schools and hosting students here at the College. Visit our Working with Schools page to find out more about our Access and Outreach activities - including our new initiative, Step Up. One area of strong focus for the College is BAME students. The Warden chairs a BAME Working Party which seeks to encourage a welcoming environment for BAME students. Both the JCR and MCR are actively involved in this, as are our wonderful BAME students, our best ambassadors. These include not just UK BAME students, but our larger numbers of international students, (some of whom have not formally identified as BAME, and, therefore, are not officially counted). So far as the BAME students are concerned, we have a particular interest in attracting UK Black students. Our Access and Outreach officers visit schools and host students to encourage applications and to help make those applications competitive. The College formally supports Target Oxbridge, a University-wide programme, and is keen to receive applications from candidates who have been through the programme. The College's commitment to celebrate BAME extends to our Old Members. We recently instituted an annual BAME dinner, celebrating the achievements of all our current and former students that identify as Black, Asian and Minority Ethnic. Ensuring that prospective students aren’t put off applying to Oxford by a fear of not fitting in is a priority for the College – as is making those that do come as welcome as possible. Those attending deemed the dinner a great success but we know it's only a start. And apologies in advance for the sound quality - everyone was having such a good time that there was a lot of background noise! The College celebrates its LGBTQ+ students and staff. 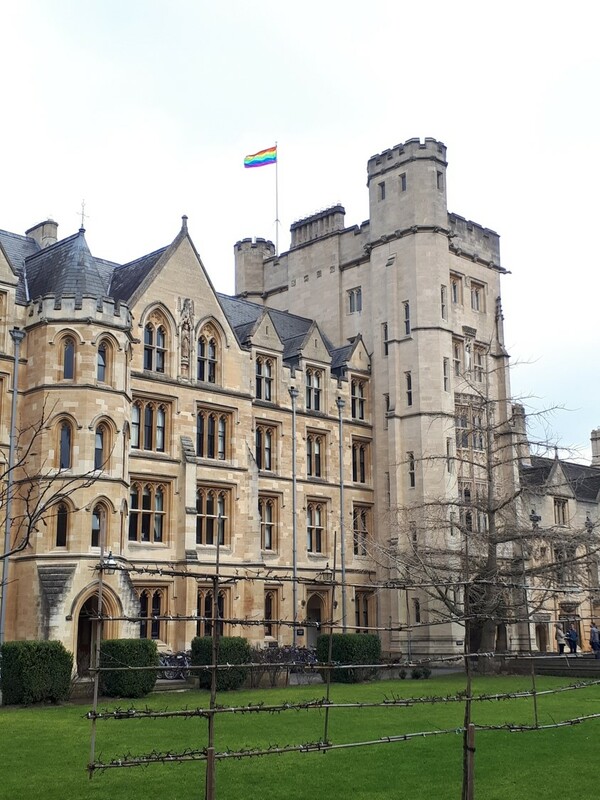 The Warden holds an annual LGBTQ+ cocktail party in the Lodgings; the Rainbow and Transgender flags fly at the appropriate times; and a joint annual event of New College Society members and students has just been inaugurated. The JCR and MCR LGBTQ+ representatives also organise a range of events for their members.